When designing Pay With Ether we wanted it to be as simple as possible to both accept ETH on your site, as well as pay with it on someone else’s. Most of the hard work is done by us, but there’s a couple of things we need users to do when they’re paying, so here’s a quick guide on the what’s what and the who’s who. Sometimes you can’t use Coinbase! So what’s the solution? 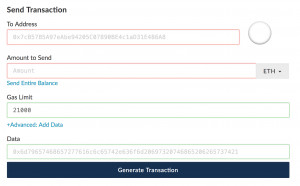 Using a service like MetaMask or MyEtherWallet. Both of these services allow you to add data to your transaction, it’s as simple as you’d expect. MetaMask is especially cool since it allows you to interact with all kinds of Ethereum websites. In fact, if you use MetaMask on a website using PayWithEther, you’ll get this shiny lovely button which does all the hard work for you! But do note, you’ll have to click the little “+ Advanced, Add Data” link before the field shows up. Hopefully that makes things a lot easier, and you can be paying with Ether like a pro in no time!